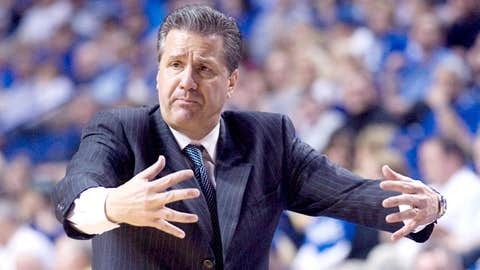 Dec 8, 2012; Lexington, KY, USA; Kentucky Wildcats head coach John Calipari reacts in the game against the Portland Pilots in the second half at Rupp Arena. Kentucky defeated Portland 74-46. Some of the biggest names in college basketball coaching are familiarizing themselves with Ohio’s airports, highways and high school gymnasiums. The Buckeye State is home to several coveted recruits in the high school classes of 2015 and 2016, and Ohio State and other Big Ten programs have high-profile company in trying to attract their services. Scout.com lists two Ohio players as five-star prospects in the class of 2015: Franklin guard Luke Kennard and Cleveland Villa-Angela St. Joseph forward Carlton Bragg. Both have Ohio State offers as well as well as offers from top programs nationally. Kennard has been visited in recent weeks by Kentucky, Louisville and North Carolina. According to reports, Kentucky offered Bragg last weekend after VASJ played in a showcase event in Paducah, Ky. The Illinois coaching staff was also in attendance to see Bragg, who also holds offers from Arizona, UCLA, Louisville, Kansas, Indiana and West Virginia. "I’ve said for two years that if Carlton does the right things, he’ll go wherever he wants to go," VASJ coach Babe Kwasniak said. Scout.com ranks the 6’9 Bragg as the ninth-best prospect and third-best power forward in the class of 2015. The 6’5 Kennard ranks as the 15th best prospect and fourth-best shooting guard. "Carlton Bragg is just a freak of nature," Scout.com recruiting analyst Brian Snow said. "He’s strong, he’s athletic, he leaps. He has developing skill. He’s shooting too many jumpshots right now but when you watch him you see the potential and the body every coach is looking for." Also getting plenty of looks when coaches come to Northeast Ohio are Shaker Heights class of 2015 forward Esa Ahmad and Akron St. Vincent-St. Mary 2016 guard V.J. King, a five-star recruit. Ahmad didn’t enter the season ranked in the top 100 in his class nationally but is garnering interest with his play this winter at Shaker Heights. The old-fashioned way, you know? "You can’t argue with production, and Esa is putting up really big numbers," Snow said. "He’s about 6’7, he’s not a tremendous athlete but he’s skilled, he can shoot, he has a great feel for the game. He gets it done. "This is just my opinion, but I don’t think Ohio State will seriously pursue Ahmad because they already have guys at that position and they’re recruiting Bragg. Esa still will have plenty of options. He has offers from Xavier, Maryland, West Virginia. "He has other offers and others taking a look. His best bet is to play out this summer and see what’s there. If he’s in top shape and continues to shoot it well, he has a chance to be a really, really good player." This week, West Virginia coach Bob Huggins came to watch Ahmad practice and then watched Bragg in a game on his way back to West Virginia. It was Huggins’ second appearance at a VASJ game in three weeks. Since 2009, Kentucky coach John Calipari has landed 20 commitments from five-star recruits. The next closest is Duke’s Mike Krzyzewski, who has 12 in that time. Both Kennard and Bragg hold Kentucky offers, and Snow said right now a Kentucky offer is "a status symbol" in the recruiting world. "It doesn’t mean Kentucky fits each guy, and it certainly doesn’t mean a guy won’t be a tremendous player because he doesn’t get offered by Kentucky," Snow said. "It’s kind of what it is right now. These guys know each other from the summer circuit. They like to say they’re better than somebody or have that bigger offer. "Kentucky, North Carolina and Duke, those three schools that don’t offer just anybody. When they come into Ohio and pursue a kid, that’s a big deal." All three have shown interest in the 6’7 King, who performed well last summer with USA Basketball’s under-16 national team. He missed essentially the first month of the high school season with a wrist injury but has returned and flashed the potential major college programs covet. "V.J. is athletic and he can really score," Snow said. "He’s the protoype shooting guard for the highest level. He has all the tools." King’s father, Vince, has answered all recruiting inquiries by saying the family is in no hurry to make a decision. Because V.J. is in the class of 2016, he has plenty of time. He was offered by Ohio State and Wisconsin during his freshman year and twice visited Ohio State’s campus. He’s since received offers from Arizona, Georgetown and Iowa, among others. King and Kennard play on the same King James AAU team. The point guard for that team is Dayton Dunbar’s A.J. Harris, a junior already committed to Ohio State and the No. 88 player by Scout.com in the class of 2015. This weekend, King’s St. V-M team takes on University (Ill.) in the Flyin To The Hoop event. University is headlined by Keita Bates-Diop, who signed with Ohio State last fall. Ohio natives Jae’sean Tate (Pickerington) and Dave Bell (Garfield Heights) are part of Ohio State’s four-player class for 2014, which ranks sixth-best nationally in Scout.com’s rankings. The Buckeyes are one of several programs still chasing Texas big man Myles Turner, maybe this year’s most coveted unsigned recruit. Harris and 6’7 Plano, Tx., forward Mickey Mitchell, another five-star recruit, are already committed to Ohio State’s class of 2015.